We are relatively new to the marketplace, but Re-Grip has already established an extensive network that includes some of the largest distribution channels and retail outlets in the United States and Internationally. The founders set out on a course to revolutionize the grip industry and to offer a product that could be used in every household, every factory, construction site, automotive facility, manufacturing plant, and everything in-between. Our product is truly that versatile and its diversity is our true value proposition. With the ability to cross over so many vertical markets, this product has the potential to change the way people look at hand grips forever. Through years of research and development, Re-Grip has designed handle grips that provide a simple, yet economical way to add grips to just about anything. Comfort and durability were crucial to our design, as was utilizing components that would ensure user safety when using a newly gripped handle or lever. UV technology is used in the manufacturing process that allows our product to stand up to nature’s extreme elements. Our design team strived to provide the perfect product ensuring ease of installation. Re-Grip is a division of Preval. Preval is a wholly owned subsidiary of Chicago Aerosol. "It was so easy to install and WOW did it make a world of difference." "I am embarrassed to say that I am addicted to Re-Grip. I have literally put it on almost every tool in my garage." "Working as a mechanic, I use tools every day. 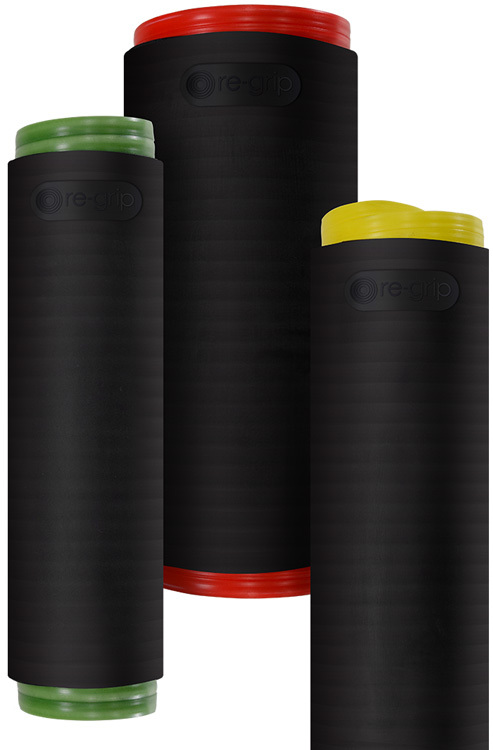 I can honestly say that Re-Grip has lessoned my fatigue and provides great comfort." "My husband and I just installed one on our exercise machine. The grips were foam and all worn and crumbling into pieces. We installed RE-GRIP in less than 5 seconds and it is actually more comfortable and better than when it was new." "I am an avid gardner and most of my hand gardening tools have hard handles. I bought your product and it was absolutely fantastic. It was so easy and comfortable. Thank you Re-Grip." "I put one on my flashlight and instantly noticed how comfortable it was. I also noticed that when it is cold it easily is 20 degrees warmer when I grab the grip. That might sound weird, but it is awesome." "Having Re-Grips handy on our trucks has been great. Every time we need a replacement grip on a construction site, we simply grab a Re-Grip and in seconds we are back up and running. It minimizes downtime while maintaining our safety requirements, which are both critical to any business." "I can easily see how it can be used on so many things. I installed it on my rototiller handles and it was awesome. It minimized the vibration and actually adds a lot of comfort." "I am a repeat offender. I now have it on multiple tools and I am an avid gardener."